I had lived in Amsterdam before I moved to Marrakech. No wonder why, on my second day in the city, I bought a bike. 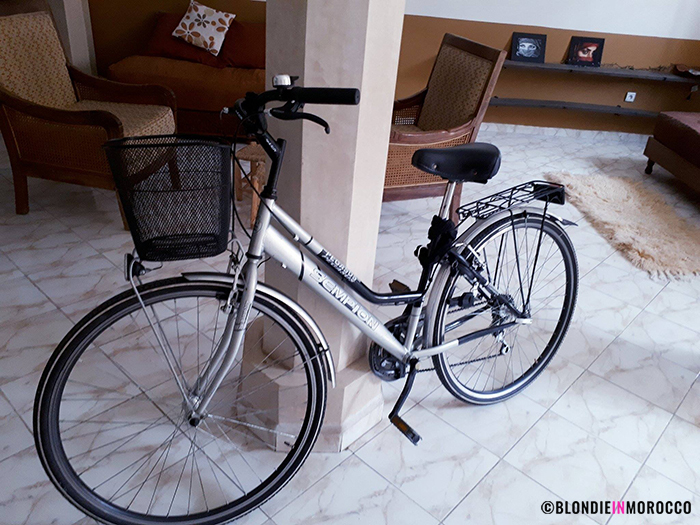 It worried me, though, how I will manage to cycle in the hectic streets of Marrakech. This city has so many more forms of transportation. Mopeds, motorcycles, donkey carts, horse and carriages – all like to use their own rules like a constant horn blowing and hand gestures. Even pedestrians cross the streets anywhere. Besides, in Amsterdam cars always stops at the red light. In Marrakech – not necessary. It took me a few days to get used to the local cycling rules. Even though the traffic in the streets looks disorganized, in this chaos everyone knows its place. In Marrakech, bicycle roads are not everywhere. So, it is a good idea to recall your car driving skills (I have my driving license for 10 years, but rarely use it). 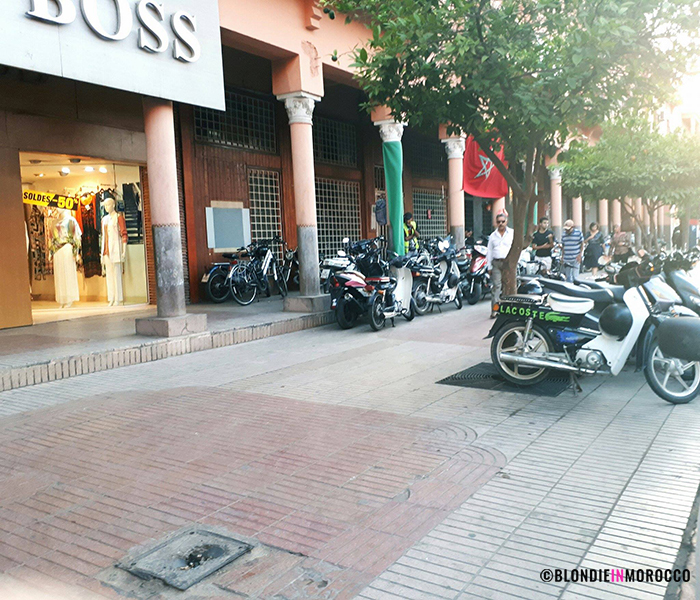 Where to park your bike in Marrakech? Leaving it attached to something in the street is a big risk. You must look for a special guard that takes care of cars, bikes, scooters for a 2-3 DH fee. How does it work? First, look for a place with many bikes/scooters and next to it you will see a guard with a safety vest. Say “hi”, show your bike and he will lead you to the best parking spot. Often, they will mark your seat with white chalk and will give you some paper. In Medina, there are many parking garages, be careful, they get full very fast and your bike can be hidden under a dozen of others. Where did I buy my bicycle? I bought my bike in the Bab El Khemis flea market. In this gigantic souk, you can find all sorts of old things. It has workshops making furniture, bedding, pottery and metalwork alongside the market stalls and individuals with their wares laid out on the ground. My first bike cost 700 DH and was a good catch. My current bike cost 1200 DH (around 100 euro) and I have no regrets. It is a great Dutch-style city bike, almost new, with gears, front basket and locks. Even more, the seller even gave me the receipt with an original bike number, so it is a very legal, registered beauty. 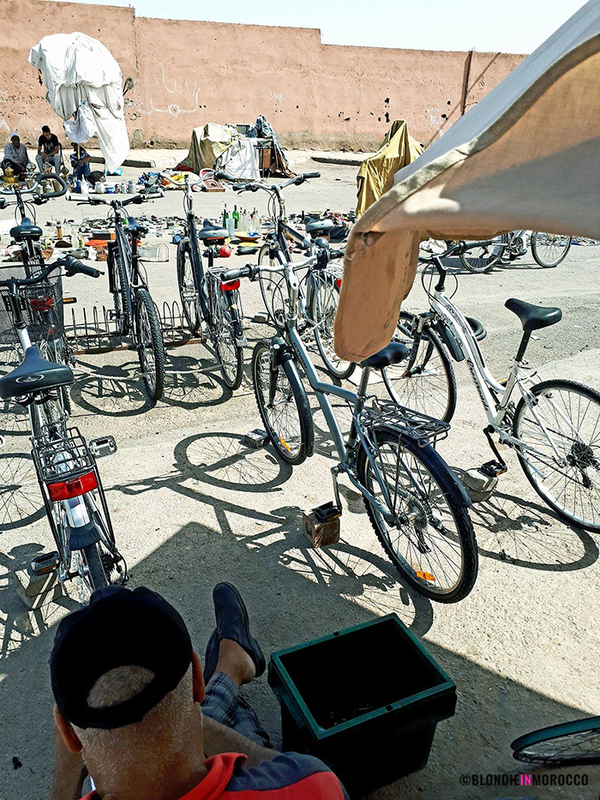 Marrakech is the first city in the African continent having the functioning bike-sharing scheme! 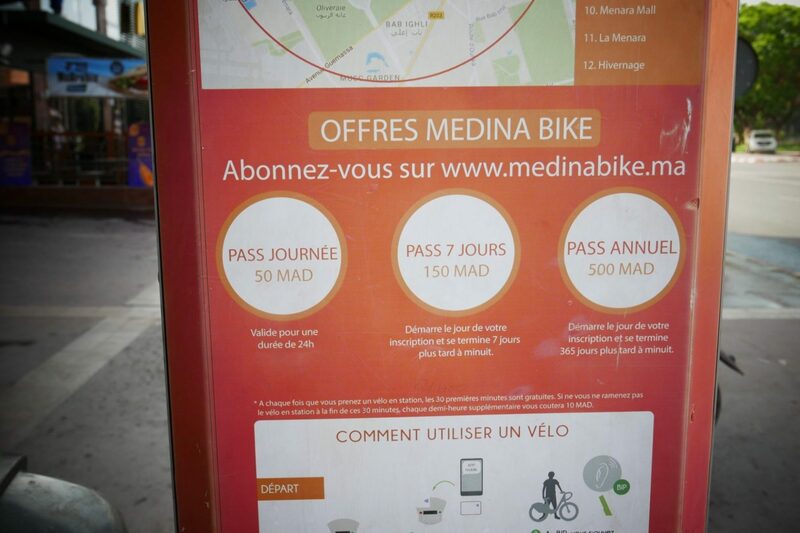 The Medina Bike Marrakesh project is launched in partnership with UNIDO, GEF, the Ministry for the Environment of the Kingdom of Morocco and the town of Marrakesh. Medina Bike is an entity of the system operator Estates Vision, working in partnership with Smoove SAS, the bike-sharing specialist. This project was organised for COP22, the UN Climate Change Conference, which took place in November 2016, in Marrakesh. 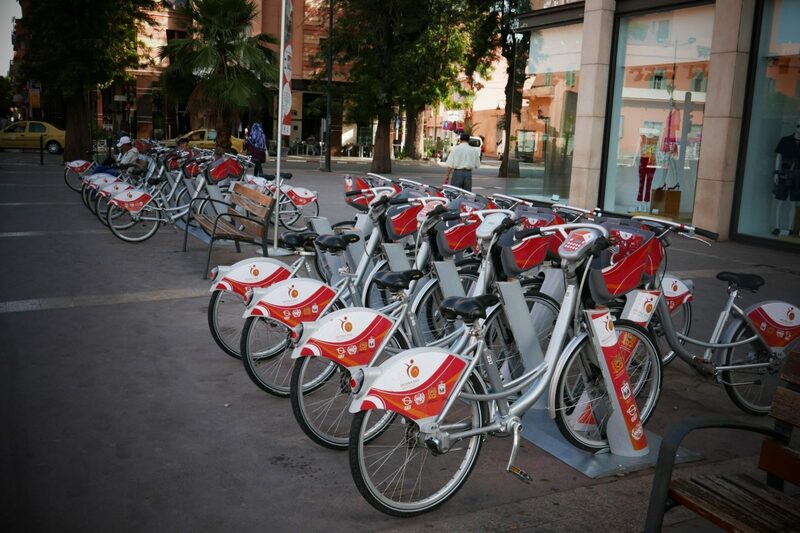 The project installed 320 brand new bikes and around 12 stations in locations, such as Koutoubia or Majorelle Garden. Bikes are available 24/7, you will need your credit card. A day pass cost 50 Dh and annual one – 500 Dh. More information here. 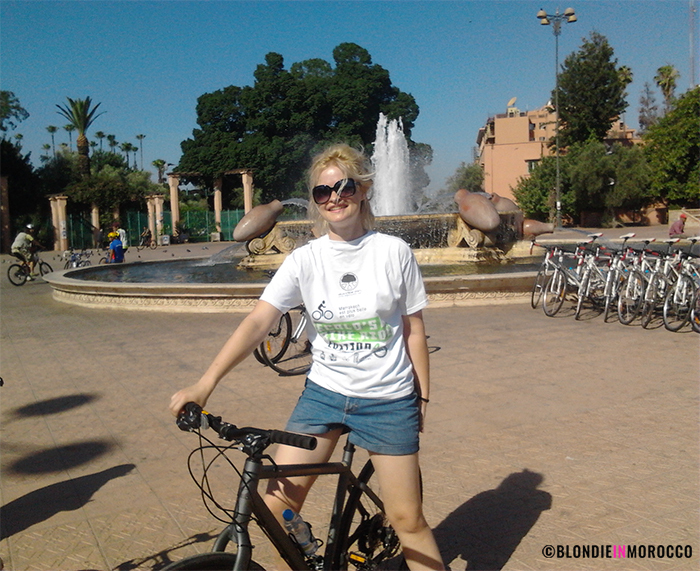 Regarding the bicycle tours in Marrakech, I would definitely recommend the Pikala Bikes project. They bring old bicycles from Holland to Marrakech and refurbish them here to use them for social bicycle projects. Pikala bikes also offer professional bicycle tours. This is really amusing article. I like this kind of informative article.. Marrakech is the starting point to start the cycling in Africa. Marrakech gives off the impression of being an exotic place, yet it seems the cycling infrastructure is pretty decent! Thanks for the post! Thank you for this very informative site. Nice to learn that Marrakech is a bike friendly city.